After a wonderful 12 days traveling with our friends through Tuscany and the last 2 days spent in Venice, I said goodbye to my husband and friends and headed for the airport for my flight to Naples. I just love flying out of Venice Airport. Taking the private water taxi from the hotel and heading out into the lagoon is always an experience that thrills me. In about 1-hour I reached the airport and checked in. The flight was about 1 hr and 30 minutes. After collecting my bags I was graciously met by my driver from Alviani Viaggi (our ground transportation company in the South of Italy). All of their cars, vans and buses are Mercedes and I enjoyed a beautiful, scenic and comfortable ride to Positano. The weather was Amazing! Warm and very windy. After getting settled in my residence I went down to the beach for a late lunch at Chez Black and to check on the ferry to Capri for the next day. 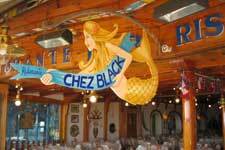 Chez Black is one of the best beachfront restaurants in Positano. I had the Linguini with mussels, clams and shrimp, with a lovely bottle of Chianti Classico. It takes about 30 minutes to walk back up the road where I stopped at a little grocery and bought some fruit, salami, cheese and bread for dinner. Then it's 80 steps and a narrow stone path to my residence, Casa Teresa. Thank goodness the rooms all come with a small fridge so you can store some drinks and food. My room also had a cute little terrace where I could enjoy the views. After an early evening, I awoke fresh and ready for my day on Capri. Teresa's espresso fueled me up and I was on the beach waiting for the ferry to Capri by 8:30 am. What a day. Crystal blue skies, deep blue sea and plenty of sunshine! 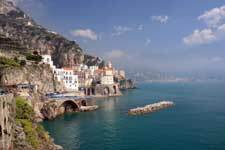 For the 31st of October it was an outrageous 76 degrees as we sped across the Bay of Naples to Capri Island. My first appointment was at Villa Piccolo Eremo which is located just a 10 min walk from the Main Piazetta and just above Marina Piccolo, where the only sandy beach on the island is located (and very tiny!). 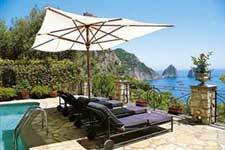 This villa has THE BEST VIEW on Capri! The real living area is outdoors on the terrace with the pool, the outdoor dining room, outdoor living room and outdoor kitchen!